If sitting, do you put both feet on the floor (similar to cello) or left foot up and right foot on the floor? I play with my left foot up, but have read the other way is better for posture, a la Alexander Technique. Many players are using shorter stools now to be able to place both feet flat on the floor. A 24″ stool works well for this. If standing, where should the bass be and how will it be balanced? Simandl, Bille, Rabbath, Nanny, Karr are a few of the many!! When to start thumb position. I have seen a method that starts in thumb position (Karr) but most wait too long. The Karr method that starts in thumb position. This may be a bit radical but methods most wait too long. Bassists need to get up there as soon as possible to eliminate the all too common fear of fingerboard heights. Thumb position doesn’t have to be scary. 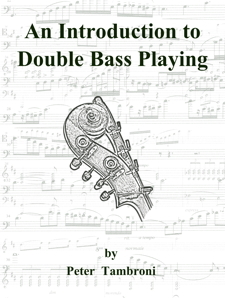 Most students are not taught thumb position until several years into their study of the double bass. This creates an inherent fear of the ‘other half’ of the fingerboard. To help eliminate this, have students find thumb position very early in their bass studies, within the first 6 months. This is a great opportunity to talk about harmonics. Have them find the octave harmonic with their thumb – they don’t have to press the string down, just use their thumb to finger the harmonic. Explain that this note is found at exactly the halfway point – another education opportunity, fractions! You can also have students do a pre-shifting exercise. Just have them move their arm from half position to the end of the fingerboard making a smooth transition into thumb position. One concept of tone production when standing is to keep bass almost completely vertical the bow and lean the bass into the bow. This is sort of a reverse concept of bow weight.